Speech: There is no such thing as good cancer! 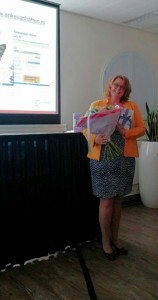 At september 8th 2015 I had the privilege to present the English translation of my book There is no such thing as good cancer! 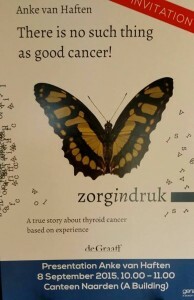 The paper version of this book will be distributed by Genzyme Europe to all European hospitals and even to the US to inform doctors about the after effects of Thyroid cancer and give more insight in the patients feelings when referring to good cancer when thyroid cancer is concerned. Later on a digital version will be made possible to share amongst patients. The Dutch version will still be available for purchase. I’d like to share my speech with you. First I need to say that my mind is not what it used to be since I had thyroid cancer. So most of the time I will read my story to you. I am very proud to be here. ”There is no such thing as good cancer! “No of course not you might say!?. I will try to explain to you why this sentence may seem logical to you but unfortunately it is not! My story begins almost four years ago while I was practicing Christmas carols in the choir I was singing at the time, I noticed my vocal skills getting less and less. I was singing the highest voice but suddenly my voice became lower and lower. I felt a lump in my neck. Because I had several other complaints like tiredness and severe constipation the doctor sent me to the hospital to check up on my thyroid. First step was a punction. The test results showed good news. The lump they found was benign. Several months went by. Because my passion was to sing and my voice was damaged by the lump, and I had more and more trouble breathing, the surgeon decided to remove the lump. The right side of the thyroid was removed in April 2012. Two weeks later I went back to the surgeon to check up on my wound. The diagnosis came completely unexpected. You have cancer he said almost instantly. It didn’t sink in. I felt nothing, completely numb. One of the first comments I got was You’ve got cancer, but it’s okay, it is the good cancer. Good cancer? Does something like that exist? All I know is the fear. Questions raise in my head. Wouldn’t I be sick? What were the risks of surgery? They told me I wouldn’t die so therefore it was good cancer. Only my thyroid would be removed and then I could live a hundred years with a chemical hormone supplement I had to take every day. It was a rough year from the diagnoses till the second operation was a struggle. The surgeon didn’t want to remove the entire thyroid because my case was different from the European guidelines regarding to thyroid cancer. The endocrinologist wanted quite the opposite. Remove the thyroid and treatment with radioactive iodine. They found three small lumps apart from each other and the doctors couldn’t say for sure whether there were more of them. During that time I felt not been taken seriously. I was angry at both the doctors; No one asked me what I wanted. It was my body, my life, my cancer. After I became more clear in my communication towards the doctors and told them how I felt, they became more understanding. The treatment with radioactive iodine was not as bad as I thought it would be. Actually, I had a lot of fun when I had to pee in the first night during solitary. I couldn’t find the light switch so I peed in the dark. When I looked down I saw a ray of light beneath me.. It was my own pee. Difficult was the period after the radioactive treatment. I was not allowed to be in the same room with my husband and kids, not allowed to hug or kiss, or eat together or use the same toilet facilities for several weeks. I felt a bit like a pariah. The doctors told me I should be able to live a normal life after the surgery. It turned out that living was not as simple as they told me it would be. Especially the time after the second operation when my entire thyroid was removed was very hard. When I look back I can say it was the hardest time. Between the second operation and the treatment with radioactive iodine I didn’t get any hormone supplements for several weeks. During that time it felt like I was slowly dying. My husband told me later that he saw me die. Getting more and more pale, weakening and tired. I couldn’t walk. It felt like my legs were so heavy and even though it was 25 degrees outside I had to cover myself with blankets, because of the coldness I felt all the time. Later I learned that Thyrogen existed. I did not understand why it was not given to me. Because otherwise maybe I would not have been that sick. It felt like I was unnecessarily bothered by declining me from medication. To give a clearer view on how I felt at the time, I would like to share this fragment in my book……. the movie The Living Dead. My husband says I am so white and lifeless that all he has to do is shroud me in a coffin. And that’s how it feels. Very slowly I feel myself deteriorating. Just hang in there! My feelings are still all over the place. I’m not doing so well, neither physically nor mentally. The after-effects of a pleasant day are burdensome. I am so tired. Like a broken butterfly. For the people who are wondering how I am doing right now. Almost four years later. Well I still have a lot of complaints. For instance tiredness, my muscles ache. I have problems concentrating, body temperature problems, weight problems, itching. My nails and hair are in bad shape, my mood is very unstable. Depression is the worst of them all. I have changed as a person. During my illness I started a diary. A personal journey through this thyroid cancer process from diagnosis till one year after that. Later I became busy on social media Talking to partners in misfortune regarding thyroid problems. I took part in the book “faces of thyroid cancer patients” which was a very positive initiative by SON and Genzyme to give a face to this illness. Still I was not satisfied. There was too much misunderstanding regarding to thyroid cancer. I learned that I was not the only one who was told that thyroid cancer was a good thing, so I decided to make my story public. My story became my personal mission to spread the word that a good cancer simply does not exist. I hope my words will teach doctors and healthy people that we are just people with an illness. Trying to cope with fear and the daily misfortunes while living without a thyroid. There is no good in that! There is only good in what being sick has taught me about life. There is more value in every day! This is what I would like to share with you by sharing this fragment of my book..
take the edge off waiting, the four of us go to the beach in scheveningen. A breath of fresh air. It works, and wow, what a difference it makes! there is only the wind, with the sea, two croquettes on a roll and a handful of shells. Sitting in the sand, I watch my two carefree and cheerful teenagers run around like two exuberant young pups that have been set free. We climb to the top of the pier, with my husband and children leading the way. I reach the top a little later because I don’t have the energy. When I reach the top, I feel two warm, safe arms embrace me. I feel intensely happy. The sea has washed the cancer away for the day. Je staat er toch maar even! Thank you! I’ll do the best I can! as a 2 year survivor of papillary cancer stage 2 I can relate to what you are going through.i have had doctors tell me I have the good cancer and I respectfully disagree.there is nothing good about having cancer.it is a very difficult journey from the start and at least for me has only turned worse.pains,aches,brain fog,all the classic symptoms no one ever tells you to expect.i now have heart palpatations,and shortness of breath.i look forward to reading your book and your experiences.good luck to you and I pray you do great the rest of your life.take care and thanks for taking the time to write something to open the eyes of people that just don’t understand that there is no good cancer! Dear Bryan, Thank you so much for your comment. Its good to hear your recognition.There certainly is no such thing as good cancer!